“Can you dance the shaking of the sheets . . .
An original poetic treatise, a celebration of first person narrative in the New Age Republique of Poetry, Somewhere The / Shaking by Sarah Cook. Sarah Cook lives and writes in Oregon, United States. She contributes articles to freelancefeminist.com and works with street youth. Her poetry has been published in The Feminist Wire, Black Warrior Review, Gaga Stigmata amongst others. There is an incredible Zen to this poetry offering, a certain transcendence, a subtle questioning of the nature of her existence in a first-person narrative. The self-introspection is a profound truthtelling where she talks around the pain of her ended intimate relationships. A comment on the love life diaspora N.A. Themes of memory, love, the house she lives in, poetry writing and solitude all tell the story of the Poet. The book of poetry begins with a list of furniture/parts of the house with a line of poetry about its essence in brackets, as if a table of contents, perhaps a reflection on the disembodied self. Interesting that the Poet lists “GARDEN (the always someday)” but it is not revisited in the text. The imagery is based in the furniture and different parts of the house/parts of her body, perhaps a metaphor, the idea of space and shelter, the idea of home and brokenness. It is as if she is living her day going from room to room in solitude, gazing into the sky and writing dear poignant letters, indeed this Chapbook is about profound loss and perhaps a celebration of what we still have. The rolling enigmatic introspection creates distance and intimacy, as an observer/love object/Poet someone caught in exile, someone watching the day, watching the road, watching the sky. language of me – my namebody). A beautiful poetic offering, at once a subtle protest as well as a celebration, a new progression on the tradition of lament. The Poet draws you in, it is as if she is a casual observer, someone caught in cloudsky watching for the next contestant in love, with a profound story to tell of the matrix. 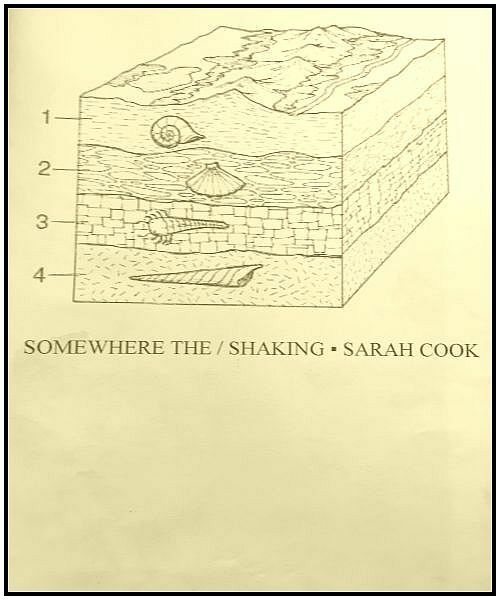 A brilliant write, Somewhere The / Shaking by Sarah Cook and above/ground press.